We continued learning about rhyming words. Your child must be able to 1) tell if 2 words given rhyme or not and 2) produce a rhyming word for a word that is given. During Reading Workshop, we learned about the difference in fiction and non-fiction books. Look through your child's books at home to see if they can tell the difference. We have been continuing handwriting using Alphabeats. We are now going back through the letters and working on lowercase letters. This week during writing, we focused on where to start writing on the paper and trying to make sure to stay on the correct line while writing. 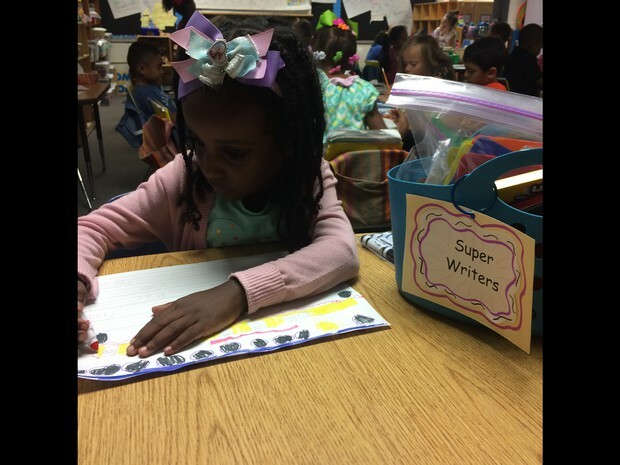 We also started the Super Writer basket this week. Children who are following the Writing Workshop rules AND implementing the mini-lesson we have taught for the day have the chance to get the Super Writer basket to use for a day. The kids are SO excited about working hard just to get a chance to use the basket. Selihom and Kendall got a chance to use the basket this week! We started patterning this week. Your child needs to be able to 1) identify a pattern 2) copy a pattern 3) make a pattern 4) extend a pattern and 5) find the missing pattern piece. Look for patterns around your house! You will find them everywhere. You can also use the pattern slide show below and have children identify patterns their classmates made. They can try to recreate these at home using different materials. We continued learning about maps this week. Congratulations to the following children who know their address. They earned a Sweet Treat! Please keep working on this at home! Several children new part of their address, but were missing a part of it. A tip is to say it in a sing-songy way for them to remember and repeat several times every day! The school has a book fair twice each year. The buying time was sent home in the folder last week. We will be going to "browse" soon and your child will bring home a list of books and prices they picked out. You can send in the list with selections you choose and the money for our buying day. The book fair will also be opened during conferences if you prefer to shop with your child. Don't forget to order your Yearbook (See the Mighty Oak for the link). Children love to get the Yearbook at the end of the year. Mark your calendars for Friday, October 7th! The Brookwood Homecoming Parade will begin at 4:45pm. They've pushed it a little later this year to help accommodate the middle school schedule. This is a fun community event and the kids LOVE it. The parade leaves from Brookwood High School, goes down Holly Brook, turns into Brookwood Manor, goes through the neighborhood leaving on Dogwood, and then ends again at the high school. TONS of candy is thrown throughout the route! Kids love it!!! Our very own Amy Granger will be in the parade as our Teacher of the Year! Hope to see you there! SIGN UP FOR BINGO NIGHT NOW! Bingo Night is my favorite night of the year (in late October)! My family always comes and has a great time. Go to the Mighty Oak via the GOES website and get the order form for Bingo Night. You can sign up now. This event usually sells out! We will not have P. E. next Week. If we are having P.E. next week, please make sure your child is wearing comfortable clothes and athletic shoes.